This Event has been read: 707 times. 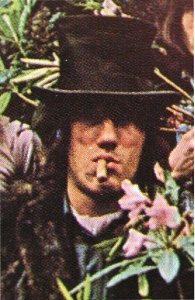 "Oh I'd be a rich man if I had all the money I owe. But to have that much, I oughta' help them sell my soul. That figure don't drive the rent man from the door. Just got time for a little more wine. Just got time for a little more wine." I like this guy, there's always time for a little more wine! Until your time runs out and then there is no more wine for you!! That’s why I always say- drink the good stuff first!! One Napa Valley winery that I would consider to be a "first growth" if such a thing existed would be Joseph Phelps Winery and the wine of course - Insignia. Insignia was the very first Bordeaux inspired blend that was made in California dating back to the 1974 vintage, before Opus One and long before any of the elite "Cult" wines of Napa that today garner $500+ in price upon release and more in the aftermarket. We tasted many of these wines on this offering over the years and I will never forget the "collectors series" wine dinner we hosted at Cafe Maxx with winemaker Craig Williams where we showcased 10 vintages of Insignia back to 1986 from local collectors cellars. Every vintage on the table including the 1998 and 2000 were outstanding! A testament to a great producer, their wines are excellent even in a difficult vintage. 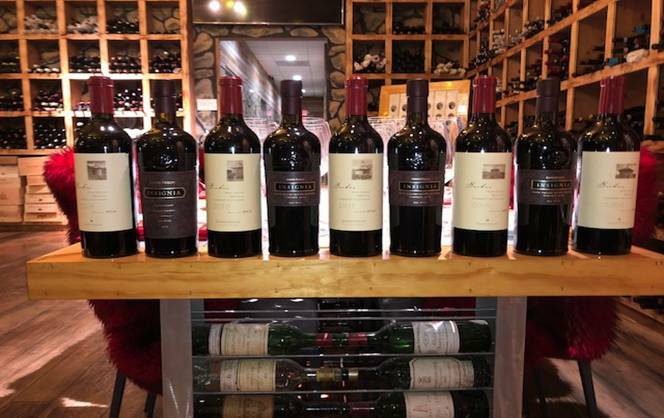 This is the first time that we have ever tasted the Backus single vineyard Cabernet Sauvignon from Joseph Phelps next to the iconic Insignia and we have 5 different vintages of both to compare this evening. There are only 14 spaces available for this tasting and the fee is $295 + tax and this includes dinner! For reservations call 954-523-9463 or e-mail andy@winewatch.com. Joseph Phelps, a Colorado construction magnate, came to the Napa Valley to build wineries for others. Like everyone else who loves wine and visits this beautiful valley, he quickly succumbed to the romance of it all. In 1972 he purchased a 600-acre ranch in the hills east of St. Helena and began planting it to different varietals. 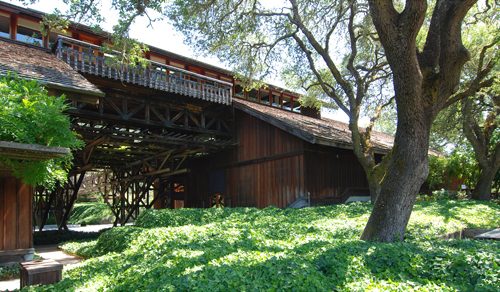 The wooden cellars, on a west-facing slope of the home property, are a tribute to two arts, architecture and winemaking. Two pavilions are joined by a closed bridge housing offices. One pavilion contains fermentors - steel in an otherwise woodsy environment - and the other holds lofty racks of French oak barrels. In addition to the home ranch, Phelps now owns vineyards in Stags Leap, Rutherford, Yountville, and the Carneros District. The first Phelps wine to appear in the marketplace was a 1973 Johannisberg Riesling. That it was an immediate success was no surprise; the winemaker was Walter Schug, born and trained in Germany. Schug left the winery in 1983 to devote full time to his new venture, Schug Cellars. (His assistant from almost the beginning, Craig Williams, assumed the reigns as winemaker.) The winery gradually began to produce a wide range of interesting, high-quality varietals - not only from its own ranch, but also from selected growers in the Napa Valley and in Sonoma County as well. In fact, Phelps once made one of California's best Zinfandels from eighty-year-old vines in Sonoma's Alexander Valley. However, the winery gradually began to trim its number of offerings and concentrate primarily on the Napa Valley for fruit sources. The winery's truly monumental wines are usually red and are based on the cabernet grape. In each vintage Phelps produces a regular Napa Valley Cabernet from grapes grown on several of the Phelps ranches as well as grapes purchased from independent growers. Some of the Phelps regular Cabs have been outstanding; the 1975 (probably the winery's best ever), the 1977, and the 1980 were at the top of their price class in the Napa Valley. In the middle 1980's Phelps acquired and developed two new vineyards in the Napa Valley - one in Rutherford along Manley Lane in the heart of the bench area and the other in the Stag's Leap District immediately north and adjacent to the historic Fay Vineyard. These two ranches have provided the backbone for the Phelps regular Cabernet as well as a Merlot that was first produced in 1989. Although we felt that the Phelps regular Cabernets had slipped in the years since 1980, beginning with the 1992 they have been again among the best in their price class. In fact, the recent Cabernets are probably the best regular bottlings produced at this winery in nearly twenty years. Although a portion of the fruit is purchased from independent growers, over half comes from the winery's Las Rocas Vineyard in the Stags Leap District and the winery's Manley Lane Vineyard in the Rutherford Bench area. Really special, however, have been the vineyard-designated Cabernets (one from the Backus Vineyard and one from the Eisele Vineyard) and the super special Insignia bottling. The Eisele bottling was discontinued after the 1991 vintage, because - unfortunately for Phelps - Milton Eisele sold his legendary vineyard to Bart Araujo (The Araujo Estate Cabernet has already garnered enormous critical acclaim under its new owners). The Insignia bottling - the flagship of the winery and the first Meritage blend ever made in California (1974) - has been consistently fine for two decades. However, beginning with the 1989 vintage, it has clearly been in the top handful of red wines produced in every vintage. Over the last few years things have been turned upside down at Phelps Winery. When long time president Tom Sheldon and long time winemaker Craig Williams were both forced to retire in May of 2008, a lawsuit followed. Unfortunately Tom Sheldon died in July of 2008 of brain cancer, but both men were awarded their 40% stake in the winery that was given to them by Joseph Phelps in 1999. In a binding judgment issued Sept. 9, 2008 retired Judge William Bettinelli ruled that Mr. Shelton is entitled to a total of $12,264,000 in damages and Mr. Williams is owed $11,856,000, according to the ruling. Their attorney stated for the record; "Everyone in Napa knows what Tom Shelton and Craig Williams did for the Phelps brand and the Phelps family," said Hainline. "It is time for the Phelps family to do the right thing, honor their agreements and acknowledge how these two men made monumental contributions to enhance the status and reputation of Joseph Phelps Vineyards and their work was what made the winery successful." This lawsuit left a bad taste in the mouth of many people in Napa Valley, but on my visit to Joseph Phelps winery in July of 2009 the staff had their best foot forward and were moving on, trying to look toward the future. Ashley Hepworth was promoted to winemaker in 2008, she has been with the winery since 1999 and we don't think that the style of the wines will change.